Hotel foyers are the traditional place to meet up when you’re staying in one. However, you never really expect to bump into Roger Glover, and if you do it wouldn’t normally be in the foyer of the Grand Hotel in Montreux… nevertheless here we are. It’s a long story and as you might expect there was a little more to this than mere chance, and we will file a full report in a couple of days when we’ve had time to take it all in. To put the location in context, this room is where Ritchie disappeared to from time to time to record some of his guitar work on the album (the black bag marks the spot). I notice sandals are clearly back in fashion too. I have been asked by the owner to explain that this building is not accessible at any time except to residents. Can’t remember if we mentioned this project here before or not, but either way the documentary film Last Shop Standing is now out (I reviewed on on my album sleeve art blog). It charts the rise, fall (and rebirth) of the indie record shop by talking to the people who run them, and some of the famous musicians who have spent their days in them. If you’ve ever enjoyed shopping for vinyl old or new, then I would recommend you checking their website to see if there is a screening near you (it’s also out on DVD). 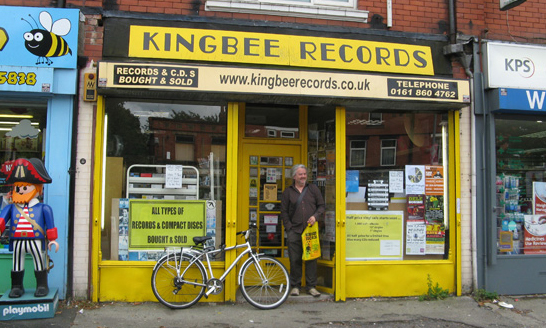 Sadly they changed their minds about using my record bag collection for the end credits so my name doesn’t go up in lights, but if you don’t shed a tear as the sight of Keith Hudson closing up his shop after 105 years in the family, then you’re made of sterner stuff than me. Think of him next time you’re passing the CDs in Asda and go and kick the manager.